In sending his disciples forth on mission, Jesus told them: “Whatever house you enter, first say, ‘Peace be to this house!’ And if a son of peace is there, your peace shall rest upon him; but if not, it shall return to you” (Lk 10:5-6). 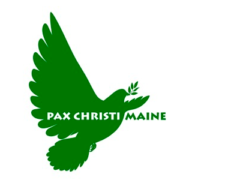 Bringing peace is central to the mission of Christ’s disciples. That peace is offered to all those men and women who long for peace amid the tragedies and violence that mark human history.The “house” of which Jesus speaks is every family, community, country and continent, in all their diversity and history. It is first and foremost each individual person, without distinction or discrimination. But it is also our “common home”: the world in which God has placed us and which we are called to care for and cultivate. Peace is like the hope which the poet Charles Péguy celebrated. It is like a delicate flower struggling to blossom on the stony ground of violence. 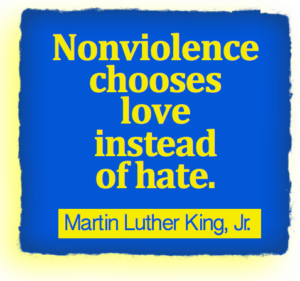 We know that the thirst for power at any price leads to abuses and injustice. Politics is an essential means of building human community and institutions, but when political life is not seen as a form of service to society as a whole, it can become a means of oppression, marginalization and even destruction. Jesus tells us that, “if anyone would be first, he must be last of all and servant of all” (Mk 9:35). In the words of Pope Paul VI, “to take politics seriously at its different levels – local, regional, national and worldwide – is to affirm the duty of each individual to acknowledge the reality and value of the freedom offered him to work at one and the same time for the good of the city, the nation and all mankind”. Political office and political responsibility thus constantly challenge those called to the service of their country to make every effort to protect those who live there and to create the conditions for a worthy and just future. If exercised with basic respect for the life, freedom and dignity of persons, political life can indeed become an outstanding form of charity. Pope Benedict XVI noted that “every Christian is called to practise charity in a manner corresponding to his vocation and according to the degree of influence he wields in the pólis… When animated by charity, commitment to the common good has greater worth than a merely secular and political stand would have… Man’s earthly activity, when inspired and sustained by charity, contributes to the building of the universal city of God, which is the goal of the history of the human family”. This is a programme on which all politicians, whatever their culture or religion, can agree, if they wish to work together for the good of the human family and to practise those human virtues that sustain all sound political activity: justice, equality, mutual respect, sincerity, honesty, fidelity. Blessed be the politician with a lofty sense and deep understanding of his role. Blessed be the politician who personally exemplifies credibility. Blessed be the politician who works for the common good and not his or her own interest. Blessed be the politician who remains consistent. Blessed be the politician who works for unity. Blessed be the politician who works to accomplish radical change. Blessed be the politician who is capable of listening. Blessed be the politician who is without fear. Every election and re-election, and every stage of public life, is an opportunity to return to the original points of reference that inspire justice and law. One thing is certain: good politics is at the service of peace. It respects and promotes fundamental human rights, which are at the same time mutual obligations, enabling a bond of trust and gratitude to be forged between present and future generations. Sadly, together with its virtues, politics also has its share of vices, whether due to personal incompetence or to flaws in the system and its institutions. Clearly, these vices detract from the credibility of political life overall, as well as the authority, decisions and actions of those engaged in it. These vices, which undermine the ideal of an authentic democracy, bring disgrace to public life and threaten social harmony. We think of corruption in its varied forms: the misappropriation of public resources, the exploitation of individuals, the denial of rights, the flouting of community rules, dishonest gain, the justification of power by force or the arbitrary appeal to raison d’état and the refusal to relinquish power. To which we can add xenophobia, racism, lack of concern for the natural environment, the plundering of natural resources for the sake of quick profit and contempt for those forced into exile. When the exercise of political power aims only at protecting the interests of a few privileged individuals, the future is compromised and young people can be tempted to lose confidence, since they are relegated to the margins of society without the possibility of helping to build the future. But when politics concretely fosters the talents of young people and their aspirations, peace grows in their outlook and on their faces. It becomes a confident assurance that says, “I trust you and with you I believe” that we can all work together for the common good. Politics is at the service of peace if it finds expression in the recognition of the gifts and abilities of each individual. “What could be more beautiful than an outstretched hand? It was meant by God to offer and to receive. God did not want it to kill (cf. Gen 4:1ff) or to inflict suffering, but to offer care and help in life. Together with our heart and our intelligence, our hands too can become a means of dialogue”. Everyone can contribute his or her stone to help build the common home. Authentic political life, grounded in law and in frank and fair relations between individuals, experiences renewal whenever we are convinced that every woman, man and generation brings the promise of new relational, intellectual, cultural and spiritual energies. That kind of trust is never easy to achieve, because human relations are complex, especially in our own times, marked by a climate of mistrust rooted in the fear of others or of strangers, or anxiety about one’s personal security. Sadly, it is also seen at the political level, in attitudes of rejection or forms of nationalism that call into question the fraternity of which our globalized world has such great need. Today more than ever, our societies need “artisans of peace” who can be messengers and authentic witnesses of God the Father, who wills the good and the happiness of the human family. 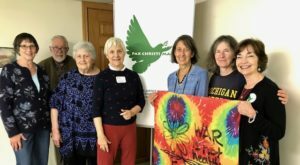 A hundred years after the end of the First World War, as we remember the young people killed in those battles and the civilian populations torn apart, we are more conscious than ever of the terrible lesson taught by fratricidal wars: peace can never be reduced solely to a balance between power and fear. To threaten others is to lower them to the status of objects and to deny their dignity. This is why we state once more that an escalation of intimidation, and the uncontrolled proliferation of arms, is contrary to morality and the search for true peace. Terror exerted over those who are most vulnerable contributes to the exile of entire populations who seek a place of peace. Political addresses that tend to blame every evil on migrants and to deprive the poor of hope are unacceptable. Rather, there is a need to reaffirm that peace is based on respect for each person, whatever his or her background, on respect for the law and the common good, on respect for the environment entrusted to our care and for the richness of the moral tradition inherited from past generations. Our thoughts turn in a particular way to all those children currently living in areas of conflict, and to all those who work to protect their lives and defend their rights. One out of every six children in our world is affected by the violence of war or its effects, even when they are not enrolled as child soldiers or held hostage by armed groups. The witness given by those who work to defend them and their dignity is most precious for the future of humanity. In these days, we celebrate the seventieth anniversary of the Universal Declaration of Human Rights, adopted in the wake of the Second World War. In this context, let us also remember the observation of Pope John XXIII: “Man’s awareness of his rights must inevitably lead him to the recognition of his duties. The possession of rights involves the duty of implementing those rights, for they are the expression of a man’s personal dignity. And the possession of rights also involves their recognition and respect by others”. – peace with all creation, rediscovering the grandeur of God’s gift and our individual and shared responsibility as inhabitants of this world, citizens and builders of the future. The politics of peace, conscious of and deeply concerned for every situation of human vulnerability, can always draw inspiration from the Magnificat, the hymn that Mary, the Mother of Christ the Saviour and Queen of Peace, sang in the name of all mankind: “He has mercy on those who fear him in every generation. He has shown the strength of his arm; he has scattered the proud in their conceit. He has cast down the mighty from their thrones, and has lifted up the lowly; …for he has remembered his promise of mercy, the promise he made to our fathers, to Abraham and his children for ever” (Lk 1:50-55). In the nonviolent world that we hope for, pray for, and envision, hate is unthinkable, and we are grateful for a Bishop that is using his voice as an authority of the Catholic Church for truth and good. Bishop Stowe sufficiently gives pause and reflection to all the elements at play in this display of racial ignorance and tension, and he calls us to a deeper understanding of human dignity. 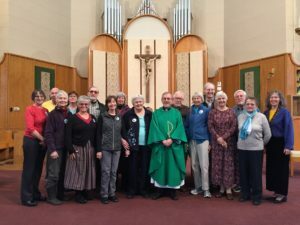 This is the kind of leadership we need from our Bishops, and standing up for a politics of love is the message that we must bring to our communities, parishes, and Pax Christi USA groups. 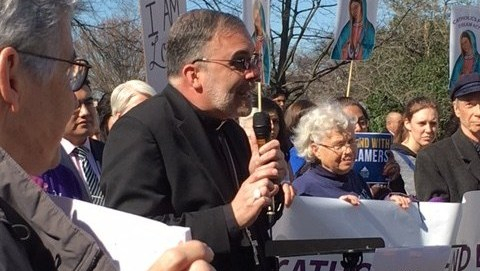 We thank Bishop Stowe for not only pointing out how structural racism has worked itself into the fabric of our nation but for also pointing out how the over emphasis on abortion has indeed become disconnected from other issues of human dignity and the affirmation of all of life. 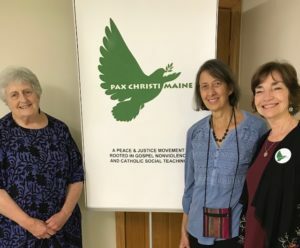 I encourage you to approach Bishop Stowe’s article with the Pax Christi USA philosophy of Prayer-Study-Action.